Recently I read a brief overview of myself and my work, an article on the Internet. 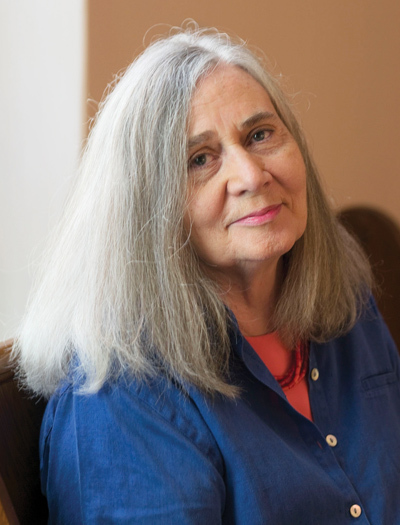 It said that if someone were bioengineered to personify unhipness, the result would be Marilynne Robinson. The writer listed the qualities that have earned me this distinction—I am in my seventies, I was born in Idaho, I live in Iowa, I teach in a public university, and I am a self-professed Calvinist. Ah, well. I will only grow older, I am happy in Iowa, my religion is my religion. That I was born in Idaho will be true forever. So I can put aside any slightest, unacknowledged thought of satisfying the standards of hipness. The review was cautiously positive despite all this, warning and alluring and also flattering its readers with the assurance that in me they will find thinking that is very unlike their own. Fair enough. The article did make me think, though, how inclined Americans are to find their way to some sheltering consensus that will tell them what to wear, what to eat, what to read, how to vote, what to think. There is nothing new in this observation of mine, though perhaps I am unusual in considering these aggregations in terms of the mass of things they leave unconsidered, neglected, and unknown. PHOTO: ALEX SOTH/MAGNUM PHOTOS UI professor emeritus and Pulitzer Prize winner Marilynne Robinson is the author of the novels Lila, Home, Gilead, and Housekeeping, as well as five books of nonfiction. Her latest collection of essays, What Are We Doing Here?, was published in February by Farrar, Straus and Giroux. Excerpted here are the opening and closing portions of one essay from the collection, which Robinson first presented at the Page-Barbour Lectures in 2016 at the University of Virginia. Looking back I realize that I have spent a great part of my adult life working to rescue wounded or discounted reputations. I’ve always known that there are risks. To say that Jonathan Edwards is not hip is to test the limits of understatement. As much might be said of Shakespeare’s Henry VI plays, John Calvin, Puritanism. At this point in my life there can be no doubt about the tropisms of my mind and soul, even though for a long time I thought I was just tidying up a few misunderstandings for my own sake, before I went on to other work. I somehow thought I was devoting the time to people and things that lacked poetry, were utterly unpoetical—believing what was always told me, implicitly and explicitly. These stereotypes are hard to eradicate, however unwelcome they might be. Distinguished names associated with Puritanism in England include Edmund Spenser, Mary and Philip Sidney, Arthur Golding, Thomas Middleton, Fulke Greville, Andrew Marvell, John Milton, John Bunyan. In Britain, social and legal disabilities as well as outright persecution discouraged nonconformist loyalties, especially before and after the parliamentary revolution and the Commonwealth. So the style of thought, the worldview, associated with Puritanism naturalized itself to the environment of the dominant culture. But about these figures I have named there is no ambiguity. It is true that their writing does not satisfy the polemical sense of the word Puritan, which is so overwhelmingly its modern sense that the most careful efforts at historical precision in the use of the word are always compromised by its associations with priggishness, acquisitiveness, hypocrisy, narrow-mindedness, and fanaticism. Still, for years I accepted, or did not know how to reject, the bleak stereotype, when it is precisely the poetry of Puritanism, and more generally the use and celebration of the English language always associated with it, that has enlisted my devoted attention. I am fascinated by history, and I don’t know what it is. I believe that, whatever it is, it is profoundly important, and I don’t know why. I am especially fascinated by erasures and omissions, which seem to me to be strongly present in their apparent absence, like black holes, pulling the fabric of collective narrative out of shape. Europeans often say our culture is Puritan—Lollard, according to Freud—and we don’t know enough history to understand what they might mean by this. We have made a project of freeing ourselves of even minimal standards of taste or discretion, and still the word clings. Ethical rigor, aversion to display, the ideal of vocation are all diminished things among us, and still we are Puritan. Most recently I heard us denounced in these terms at a dinner table in London. How horrifying our rules against sexual harassment! It is the most natural thing in the world for students to fall in love with their professors, subordinates with their superiors! And so on. My suggestion that this might all seem very different from the perspective of the student or the subordinate, and my thoughts about fairness, merit, and so on, were not of interest. They were merely one more Puritanical pretext for denying the pleasures of life. I think in many cases Puritanical may simply mean “reformist,” tending to assume that even very settled cultural patterns and practices can be called into question, that they are not presumptively endorsed by culture, that what is traditional cannot claim therefore to be rooted in human nature. We tend to forget that our revolution was one in a series—Geneva expelled its Savoyard rulers and was governed by elected councils. The Dutch expelled the Hapsburg emperor and in the process trained sympathetic British volunteers who took the experience home with them. Then with the Puritan Revolution England tried and executed its king and attempted a decade of parliamentary government. More than a century later the American colonies rejected monarchy as a system on the basis of the abuses of the king then in power. This is not logical, strictly speaking, but it affiliated the Americans with the great precedent of the English revolution, the revolution of Milton and Marvell. The most revolutionary idea contained in all this is that society as a whole can be and should be reformed. This Puritan energy does indeed continue to animate American life. Again, I am aware of exploring lost history. I mentioned how aware I am that I bear the stigma of living in Iowa and of teaching in a public university. This country grossly impoverishes itself with this condescending or contemptuous dismissal of vast reaches of its terrain and the multitudes who live and die there. I have been asked a hundred times why I teach at Iowa, by people sophisticated enough to know that in my field anywhere else on earth would be a step down. So perhaps I teach at a public school in the Midwest because I am an elitist. I have my own reasons for being glad that Iowa is in Iowa. I would never myself have discovered the region or its history, which is an epochal part of our national history and which settled into my literary imagination as satisfyingly as the prairie instructed me in a new aesthetics. And I take comfort in the fact that the state has no death penalty, that there are earnest and ambitious efforts to educate people in prison. I am pleased that Iowa has one of the highest literacy rates in the country and the fourth-lowest rate per capita of gun ownership. If I were to use that profile to choose a better state to live in, I would be hard-pressed to find one. I am pleased that marriage equality was recognized early in Iowa, and that, since it was a territory, Iowa has had no laws forbidding interracial marriage and no laws permitting segregation in schools. If I were to add these to the profile, my choices would be narrower still, probably approaching zero. Every four years the national media come to Iowa to photograph cows. Since I am a connoisseur of forgotten places, I have a house in upstate New York. I could demonstrate for the press the existence of many cows, just a cab ride and a train ride from Trump Tower. Speaking of which, or of whom, I don’t appreciate being blamed by The New York Times for that phenomenon, that most New York phenomenon, a sort of political Paris Hilton, famous for being famous by virtue of their own fascinated attention. There’s no point mentioning that Donald Trump didn’t win Iowa, since Ted Cruz did. In any case, rumors persist that Cleveland has an orchestra and also a clinic. Chicago has some interesting architecture and a few decent universities. There’s a museum in Kansas City whose Ancient Near Eastern collection is more or less inexhaustible, if you like that sort of thing. There are those for whom Ann Arbor is a synonym for paradise. I joke, of course. A region of sixty million people of every possible ethnicity, thickly strewn with colleges and universities and with a long history of relative wealth, is no simple “heartland,” no backwater or cultural desert. If population density is productive of desirable traits, it has its great conurbations. I will mention, however, that Iowa City is larger than Periclean Athens. I am weary of omissions, of failures to acknowledge. People can be convinced that they live in a small country, for all purposes, where there are few options, and markers of success or failure that will be recognized anywhere. My reformers had a glorious sense of space and freedom, very deeply impressed by obligation. They made it, by human and historical standards, a great theater of heroic generosity, which, despite all, is sometimes palpable still. At this time the country needs to regain equilibrium and direction. It needs to recover the memory of the best it has done, and then try to do it all better. Excerpted from What Are We Doing Here? 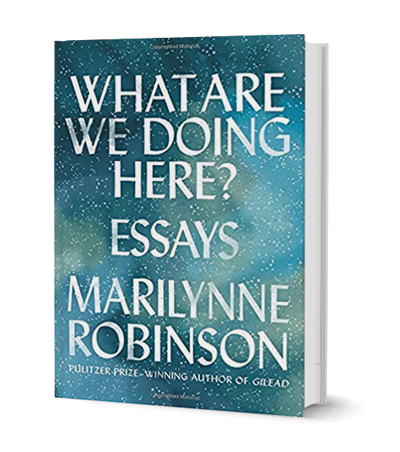 : Essays by Marilynne Robinson, published by Farrar, Straus and Giroux. Copyright © 2018 by Marilynne Robinson. All rights reserved.